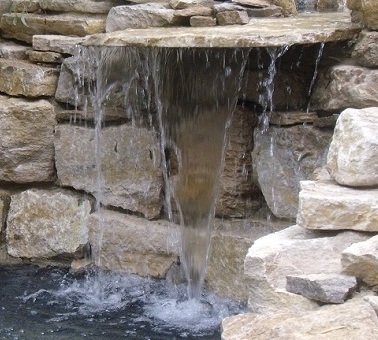 Stone waterfall cascade garden water feature in London by Water Scenes. We design and construct our waterfalls and cascades to be unique. Adding a garden Waterfall will undoubtedly increase the visual impact of any pond design, they also help to oxygenate water which has a very positive effect on the ponds overall Eco balance. See our main page to find out more about our water feature services or waterfall design and installation page to view the article which this picture features.